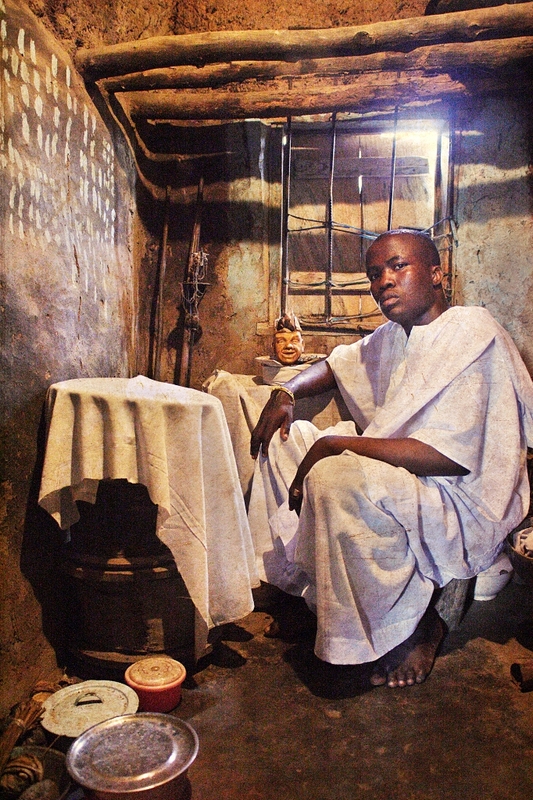 Adolphus Opara’s ‘Emissaries of an Iconic Religion’ opened on March 11th at the Centre for Contemporary Art, Lagos (CCA,Lagos), and will run through to April 21, 2013. A first major solo exhibition in Nigeria by the Lagos-based photographer, fifteen images from the twenty strong Emissaries series made between 2009–2011, offering a unique and visually compelling photographic portrayal of the custodians of indigenous religious beliefs are featured. Through this body of work, which pushes the boundaries of contemporary portraiture, Opara highlights some of the existing tensions between the cultures of animist belief and organized religion. The works inform the sensitive debate surrounding the demonization and denigration of traditional religion instigated by colonial and missionary rhetoric, and more recently by the most dominant and visible forms of the religious belief system in Nigeria and across the continent, Islam and Evangelical Christianity. These issues of power and representation are at the fore of present tensions and civil unrest between what is characterized as the Muslim north and the Christian south. Emissaries of an Iconic Religion goes beyond the reportage and documentary style characteristic of Opara’s work. It stands apart from his Rugbol(2009/10) series, or his ongoing projects Shrinking Shores(2011-) and Cocoa(2011-)in its contextual assertions and stylistic composition. The composition of the images by Opara align closely with the formal photographic portraits of prominent Yoruba people in Nigeria as well as with the art historical conventions of portrait painting. 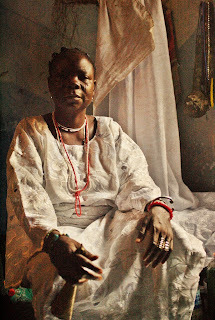 Using a large format painterly style saturated with luxuriant colours, placing the subjects frontally within the composition, as well as subtly highlighting the symbols and paraphernalia of their positions, Opara attempts to re-assert the importance, the centrality and the vitality of local belief systems despite the incursion of external pressures. Arresting and uncanny, these images of diviners from the regions of South-Western Nigeria Opara engage our identities in the 21st century and its inherent meanings. Whilst a return to traditional belief is not advocated, an engagement of their role within contemporary society is warranted. 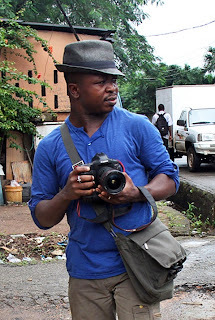 Adolphus Opara (1981, Imo State) has exhibited widely locally and internationally. Recent exhibitions include Contested Terrains, 2011, Tate Modern, London; African Lace, 2010, Museum fur Vulkerkunde, Vienna, Austria; African Photography Encounters, 2011, Bamako, Mali; The Tie That Binds Us, 2012, Tiwani Contemporary, London among others. 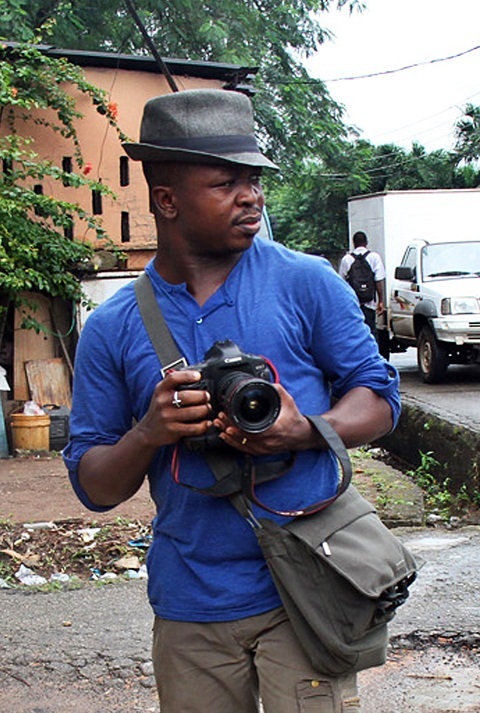 He has undertaken assignments for notable organizations and his works have been published in magazines, books and websites including the BBC, World Press Photo ENTER, New African Magazine and Nigerians Behind the Lens, the first Fine Art Photo book showcasing contemporary photography from Nigeria. Emissaries of an Iconic Religion is curated by Jude Anogwih and organized by CCA, Lagos. The exhibition is generously supported by the British Council, London.